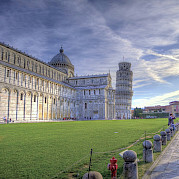 This bike and boat tour in Italy has been one of our most popular tours for years. 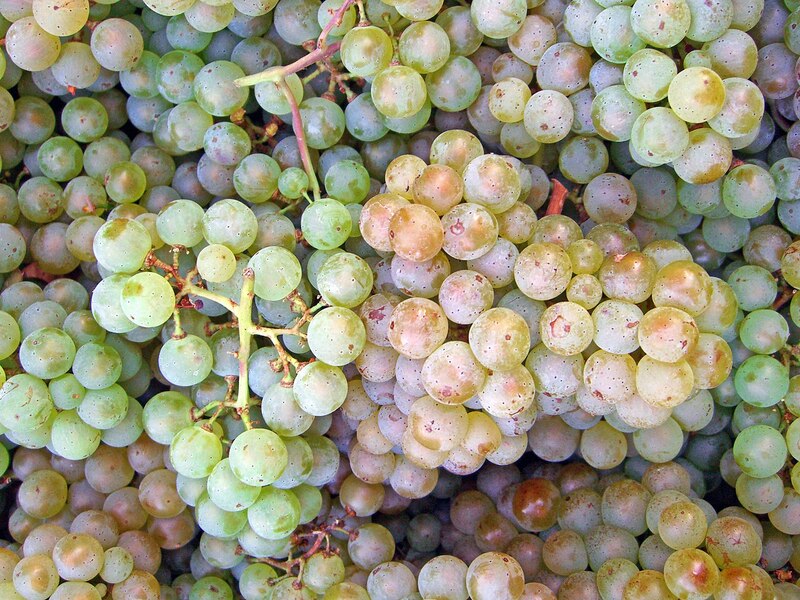 Blending nature, culture, and fine cuisine, it is a delightful and relaxed journey along the River Po, offering more than just a glimpse into Italy. You will get up close and personal! 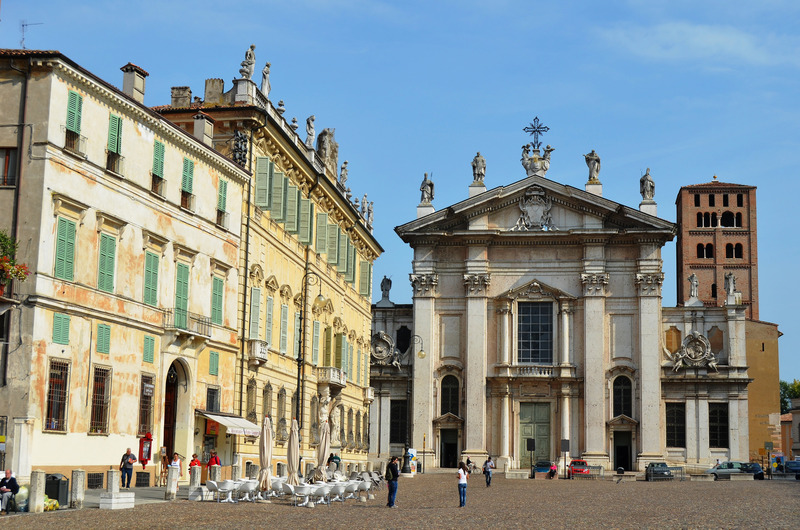 This tour includes Mantova, surrounded by lakes, and boastful of its centro storico with dozens of fascinating piazzas, churches, monuments, and courtyards! You will visit Castelguglielmo, cycle through small villages and hamlets, and pass through Ferrara, known as the City of the Renaissance and a UNESCO World Heritage Site. 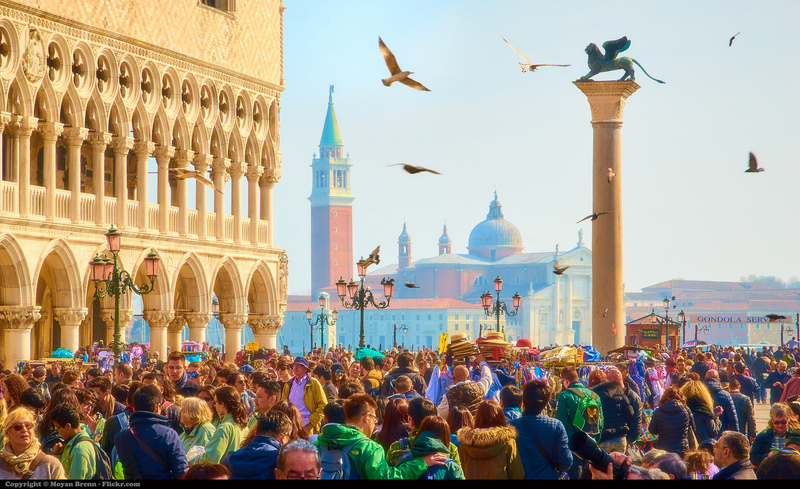 And of course, your tour features Venice, a delight of lavish palazzi, elaborate bridges, quaint piazzas and magnificent churches all crammed into a maze of narrow streets and canals. So go to Italy! 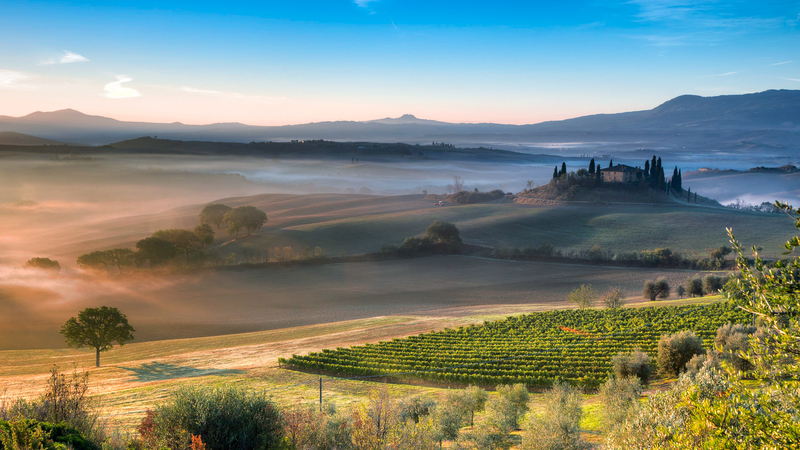 Explore celebrated cities of art, one of Europe's prime Nature Reserves, and a wealth of tucked-away rural hamlets, topping it off each day with authentic regional dishes back on board. 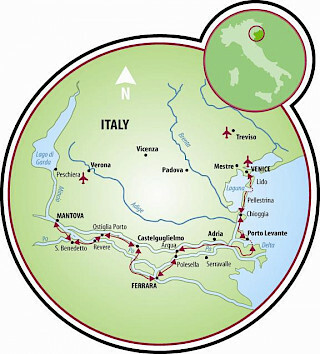 *This tour is available in both directions, Mantova to Venice and Venice to Mantova. 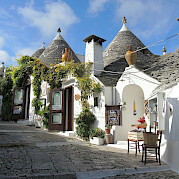 Do you want to add to your bike and boat experience in Italy? For those considering a departure from Mantova, you can add a pre-extension from Bolzano. A self-guided hotel to hotel tour ending in Mantova where you board the boat. Check it out: Bolzano-Mantova-Venice. 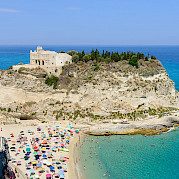 We have other bike and boat tours in Italy that feature the Mediterranean and Tyrrhenian seas! Dates are posted and you are able to book. Pricing is pending. Expect approx. 4% increase from 2020. Children's discounts available but only on the Ave Maria and only applying if child is occupying third or fourth bed in cabin. Note that fourth bed is only available on the Ave Maria and only in the superior cabins. Ask us for pricing. The e-bikes must be rented for the entire tour, not on a daily basis. If a standard bicycle is available, you might be able to enjoy one or two days on the standard bike as well, for no extra charge. This will be based on availability. 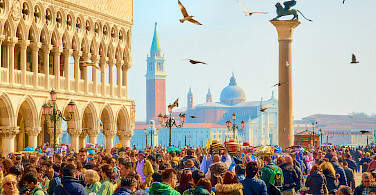 You can fly into Venice, Milano Malpensa, Verona, or Treviso airports. Most people do fly into and out of Venice Marco Polo Airport (VCE). 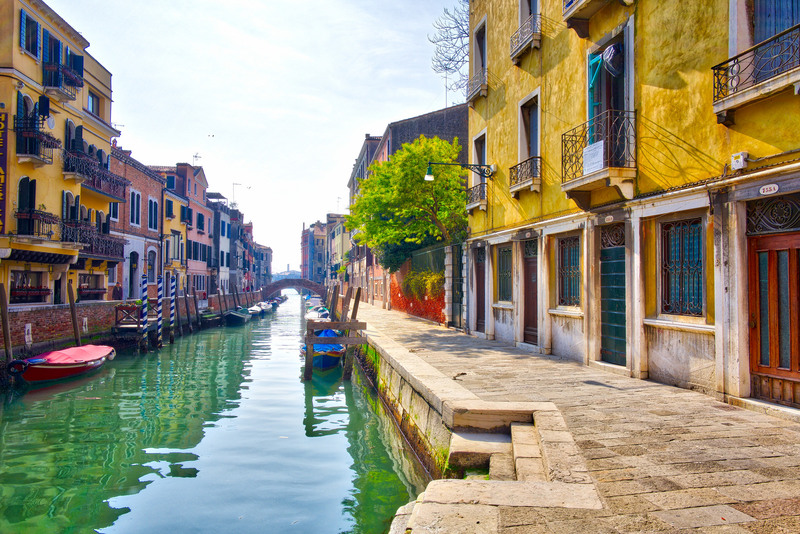 From Venezia Marco Polo (VCE) airport, you can take the Fly-Bus shuttle service going to Venezia train station. The shuttle leaves every half hour. The ride takes about 20 minutes and a ticket costs approximately €8. Visit www.atvo.it for details. From Venezia Mestre, you take a train to Mantova (travel time is about 2 and a half hours with a change in Verona Porta Nuova, costs from 30 to 50 euro depending on the type of train). For further information on timetables and prices, please visit the trenitalia.com site. Beginning in Venice From the Venice train station to Giudecca Island, you can take a vaporetto (water bus). The vaporetto stop is REDENTORE. The average temperatures in degrees Fahrenheit for the area are: March, 54°/40°; April, 61°/46°; May, 70°/55°; June, 76°/61°; July, 81/65°; August, 81°/64°; September, 74°/59°, and October, 64°/50°. Children’s bikes and accessories such as child bike, child trailer, child seat, follow me tandem, or family tandem are available. Please note that you will be part of an international group of people. However, your tour guide and crew members will always speak English. 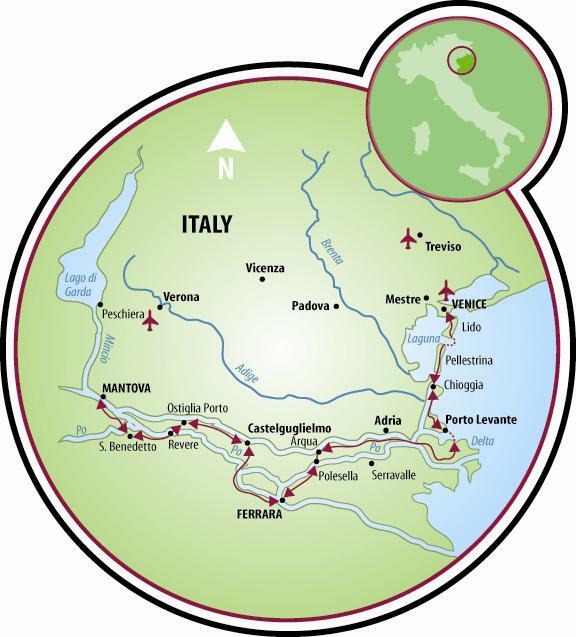 Easy, guided or self-guided bike tour in Italy with daily distances from 19 to 38 miles. The tour is entirely on level ground. Much of the pedaling is along rivers and canals on tarmac bicycle paths or roads with a low volume of car traffic. It is anticipated that the boat will sail part way during breakfast or during the evening meal to make getting out of the towns easier or to shorten the stages. 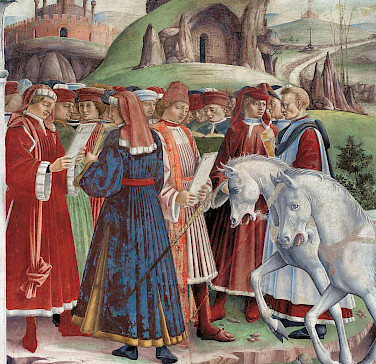 During the weeks in which departures are from Venice to Mantova, the daily program needs to be read in reverse order. Note: This tour can be both guided and self-guided. There is always a tour leader on board, but if you prefer to cycle on your own, that is also possible. You will have to follow the schedules because there are some fixed timetables which have to be kept. On board the Vita Pugna, a Comfort class ship or the Ave Maria, a Premium ship. Electric bike, available with supplement. See pricing. 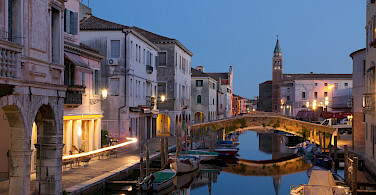 Extra nights in hotel possible in Venice, Mestre, or Mantova. Day 2: Mantova, 21 mi. (35 km). Day 8: Venice, departure following breakfast. 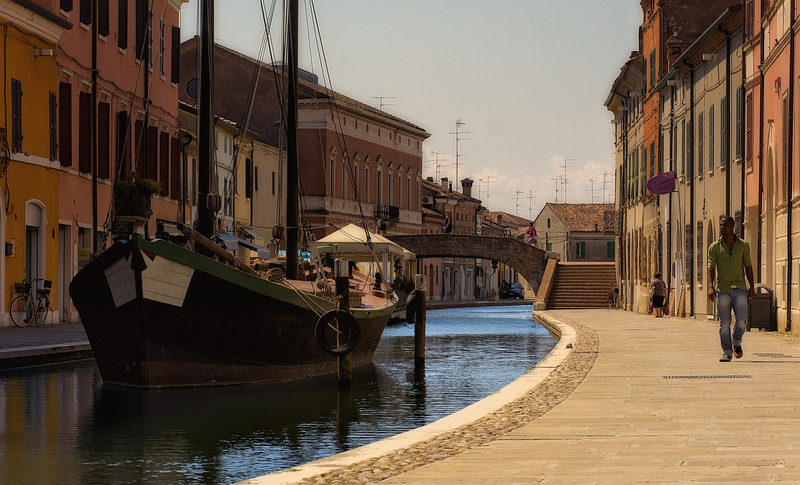 *The program has been planned to feature navigation along the Fissero/ Bianco canal, which runs parallel to the Po river and connects Mantova to the Adriatic Sea. Due to unforeseen circumstances such as weather conditions or provisions issued by local authorities, the itinerary may be subject to some changes before and/or during the holiday. Issues with high and low water, as well as logistic obstacles such as officially ordered but previously not announced repair work on locks or bridges can modify some of the daily stretches or overnight stays and may even require a transfer by bus. These decisions may be made with little or no notice by the ship's captain. 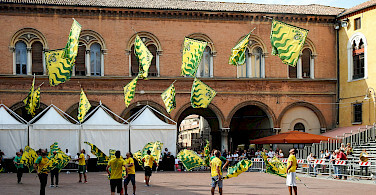 DAY 1: Arrival in Mantova. Your cabins will be available from 4:30 p.m. The boat is moored at Porto Catena, just a short walk from the city center. 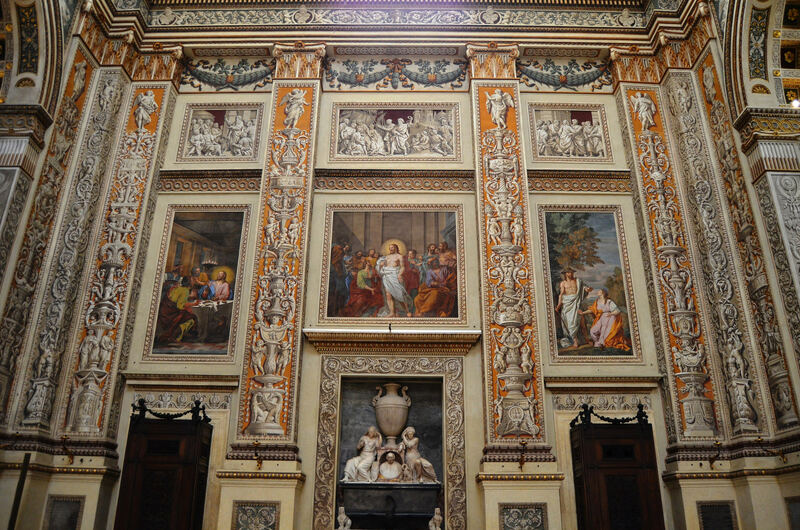 The meeting with the tour guide and the crew is scheduled at dinner-time, approximately 6:30 p.m.
Mantova is one of the most beautiful towns in Northern Italy as many worldwide know artists have left their masterpieces for us to enjoy, thanks to the famous Gonzaga family! Benvenuti a Mantova! This entire day is dedicated to the discovery of this wonderful city and its surroundings, dominated by the wealth and influences left by the Gonzaga family, who owned the city for over 400 years. Mantova was considered one of the most important cultural cities in the Renaissance and it still maintains a lot of the landscapes and the building that made it famous during that period. In the late afternoon, a local guide will lead you through the most known highlights of the town. After breakfast, on board, you navigate from the "lakes" of Mantova and cruise through the lush wetlands that lead to Governolo Lock, where Mantova's Mincio River flows into the Po. 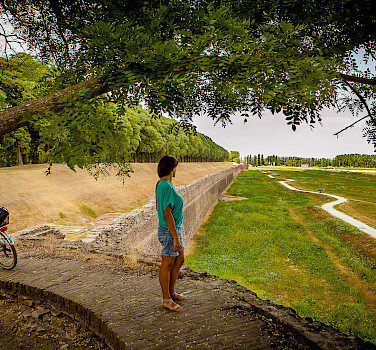 From here, by bike, you follow the broad sweeps of the levee towards Ostiglia, renowned for its medieval fortress and fierce fighting in 1945, as the Allies drove Hitler's forces back. Next: Bergantino, home of the distinctive Museum of Fairground Rides and its collection of street organs, all expertly restored (and thunderous!). 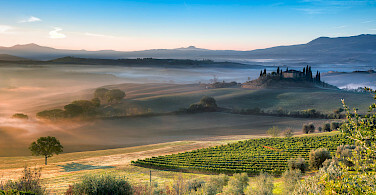 This village is also in the heartland of Grana Padano, the arch-rival of Parmesan. A visit to the local cheese factory, sampling some well seasoned Grana, is a must do. You meet the barge in Zelo, a sleepy village on the Canal Bianco, the waterway which runs parallel to the Po. Following breakfast, you will start cycling towards Ferrara. Once you have reached the town, which earned the name of "city of bicycles", you will be enchanted by the historical center, still surrounded by the old city walls. 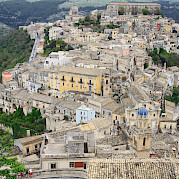 You will enjoy a guided town tour. From Ferrara, a short bus transfer will bring you to Adria, an ancient Greek port, famous for trading amber coming from the Baltic. It's remarkable museum also bears witness to its Etruscan, Roman, and Venetian Heritage. After a short ride on board, you cycle into the delta of the life-giving Po. This unique wetland is the prime reserve in Europe for herons and home to a sizeable colony of flamingos. Weather permitting, as you continue towards Chioggia, you can also enjoy a stop at a beach and a dip in the Adriatic – not forgetting a hot savory piadina! Chioggia is also known as "Little Venice", a colorful fishing hub. 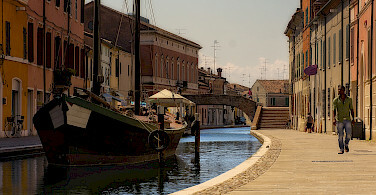 The overnight takes place on the island of Pellestrina, just in front of Chioggia. Venice beckons, but first another world altogether: Pellestrina, the first of two islands you traverse today – a humble and tranquil fishing backwater, picturesque as ever with its cottages, boats, and nets. A short island-hop by ferry transfers to Lido. Fashionable in high society ever since the Belle Époque, the Lido di Venezia is now home to the International Venice Film Festival and its galaxy of stars. 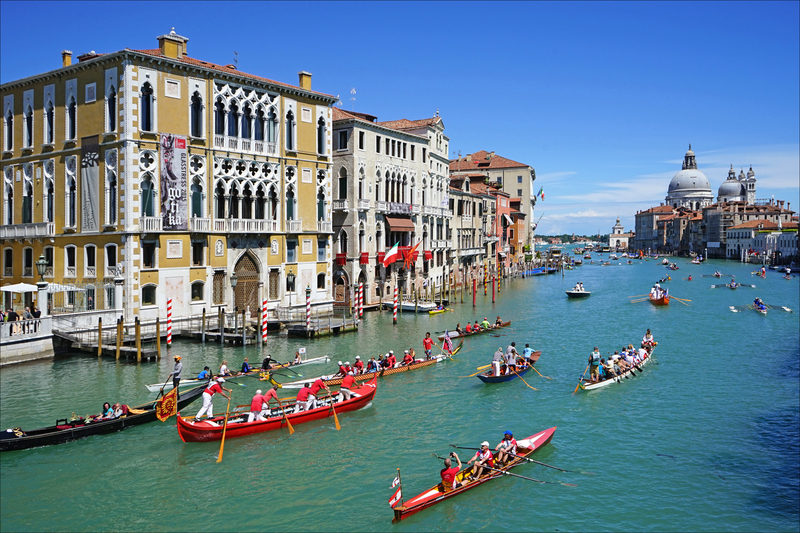 After rejoining the barge, you will enjoy a leisure cruise in front of St Mark’s square to the final destination. 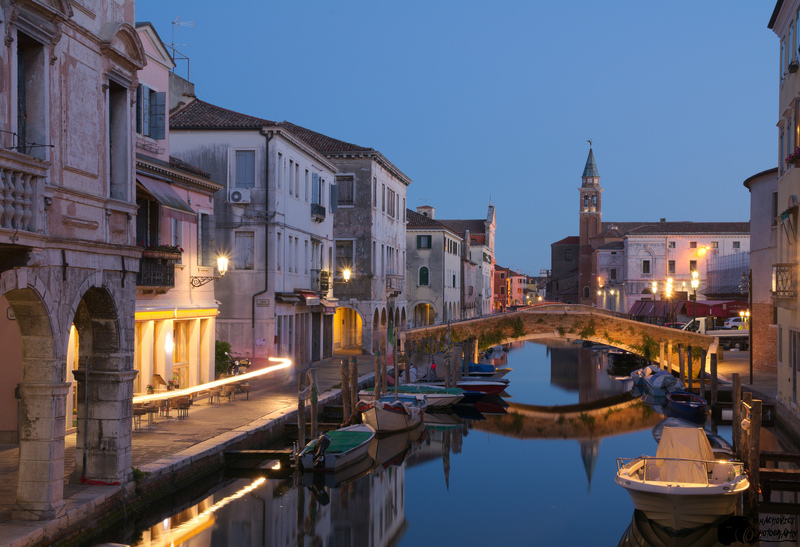 After dinner, you can savor Venice at night, now free of the crowds and at her most romantic: Benvenuti a Venezia! 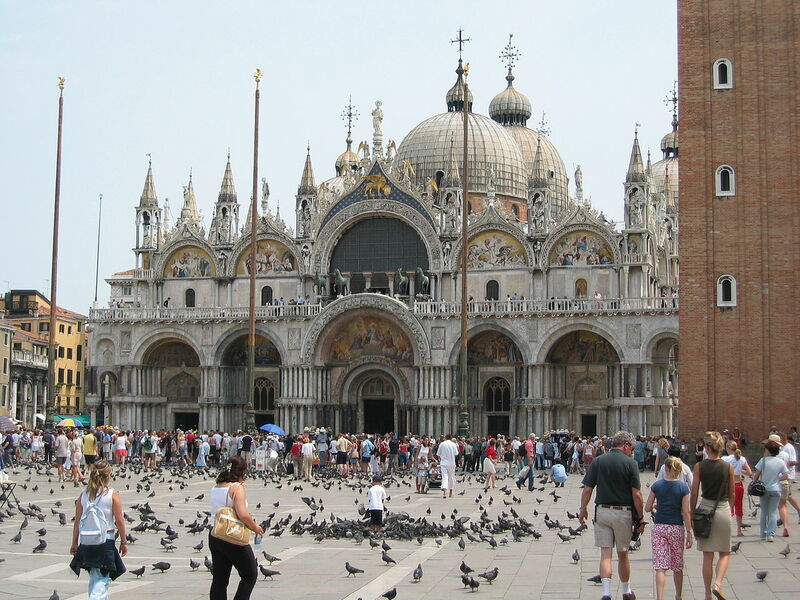 A guided walking tour of Venice begins around 11 am and lasts approximately 1.5 hours. It begins in St. Mark square and continues towards the bigger "sestiere" of the city, Castello. 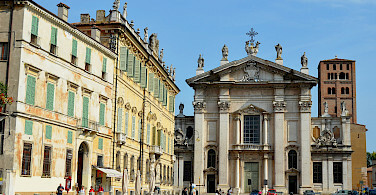 You will visit Campo Santa Maria Formosa where you can experience a characteristic market and then a city hospital and large gothic church in Campo dei Santi Giovanni e Paolo. 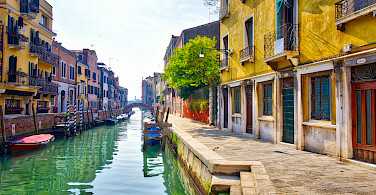 Later, you will go to Campo Santa Marina and to the Rialto Bridge. During this tour, the guide will explain these sites from the outside, no entrances are planned. However, the guide may decide to adjust the schedule and sites depending on weather and requests from the group. After breakfast and the customary goodbyes, free time for individual visits of Venice before returning home. **Due to organizational reasons, weather conditions or provisions issued by local authorities, the itinerary may be subject to some changes before and/or during the tour. Issues with high and low water, as well as logistical obstacles such as officially ordered - previously not announced - repair work on locks or bridges can modify some of the daily stretches or overnight stays and may even require a transfer by bus. These decisions are at the sole discretion of the boat captain or tour guide. 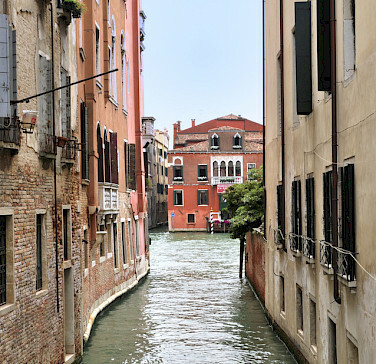 After breakfast, and perhaps following a bit of exploring off the beaten track with your tour leader, you will meet up with your Venetian guide for a tour through the historic center. 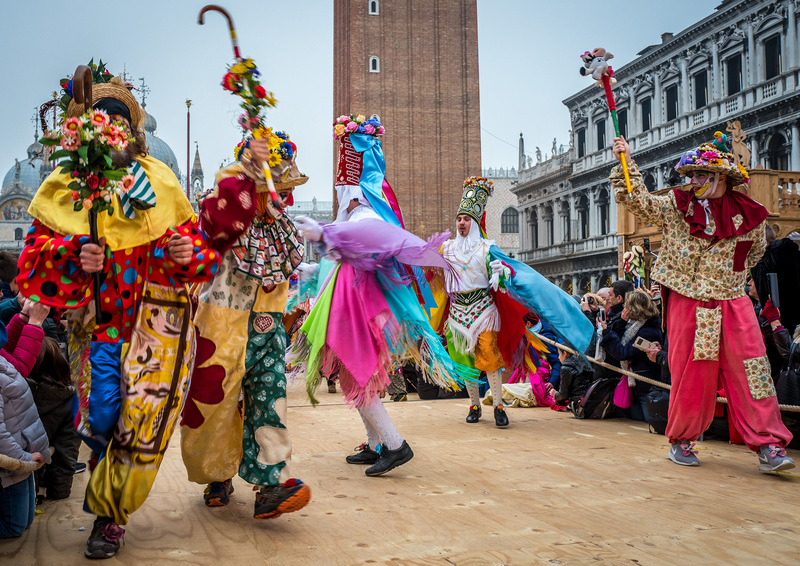 Christened La Serenissima ("The Most Serene"), the Venetian Republic held sway over much of the Mediterranean (and beyond) for centuries – both as a military power and a beacon of culture, her explorers reaching as far as China and Newfoundland. After your guided tour, you have the afternoon free to enjoy the city at your own pace. Leaving Venice behind after a leisurely cruise in front of St Mark’s square, your cycling adventure starts on the Lido, the first of two islands that you will traverse today. Fashionable in high society ever since the Belle Époque, the Lido di Venezia is now home to the International Venice Film Festival and its galaxy of stars. A short island-hop by ferry leads into another world: Pellestrina, where you ride past the picturesque cottages and boats of this humble fishing backwater. You rejoin the barge just in front of Chioggia – a bustling and colorful fishing hub known as "Little Venice". You begin your day with a morning stroll through Chioggia, followed perhaps by a visit up the millennial clock tower – the oldest in the world – for some breathtaking views. Weather permitting, you can also bask in the sun at a fine-sand beach nearby and enjoy a dip in the Adriatic, topped off with a hot savory piadina. Then it is onwards into the delta of the life-giving Po. This unique wetland is the prime reserve in Europe for herons and home to a colony of flamingos. You moor for the night in Adria, a key Roman port, once washed by the waters of the sea which bears its name. 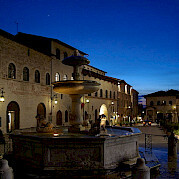 Adria is also renowned for its Etruscan and Greek heritage. 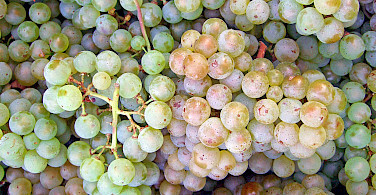 An after-dinner, you will enjoy a passeggiata into town for a well-earned grappa or gelato is in order. After a short cruise on board, you pedal following the Po through farmland and hamlets until Ferrara. Under its ruling family, the Este, this city-state attracted architects, artists, and scholars for centuries, pioneering town planning principles that have been emulated worldwide ever since. 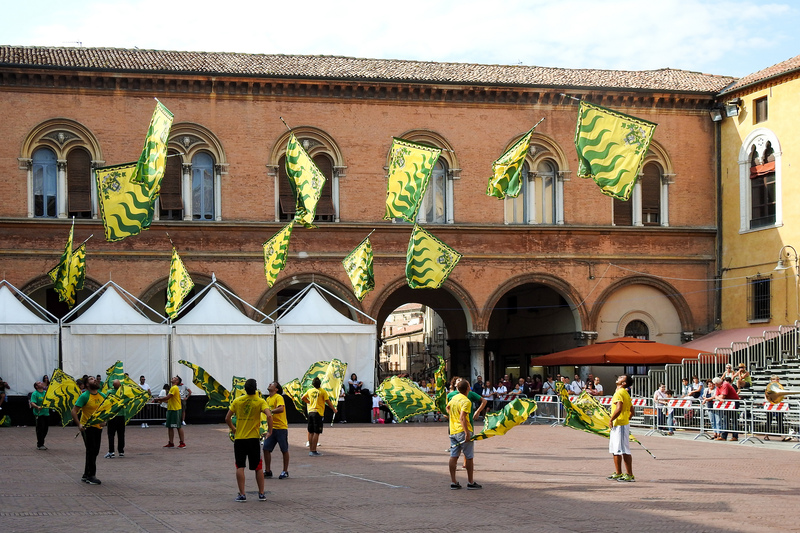 To this day, Ferrara University ranks among the best, and the town is dubbed the ''Cycling Capital of Italy". A private bus and trailer take us back to our floating hotel in Zelo, a sleepy village on the Canal Bianco, the waterway which runs parallel to the Po. This morning you head for the village of Bergantino, home of the distinctive Museum of Fairground Rides and its collection of street organs, all expertly restored (and thunderous!). 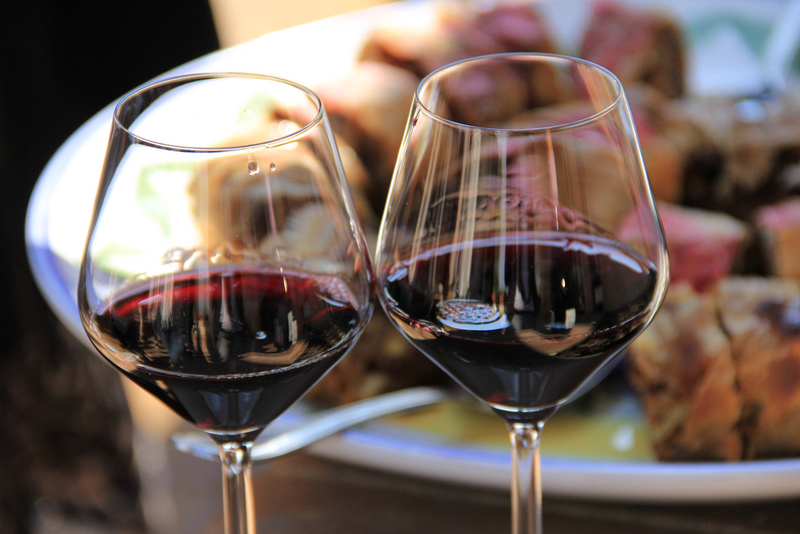 But first things first: you are in the heartland of Grana Padano – the arch-rival of Parmesan – and after visiting the local cheese factory, you enjoy a degustazione of sharp and seasoned Grana, washed down with a glass of Valpolicella. After the customary picnic lunch, you leave Bergantino and follow the river to Ostiglia, famed for its medieval fortress and the fierce fighting that took place here in 1945, as the Allies and partisans drove Hitler's forces back. You ride on and rejoin the barge at Governolo Lock, where Mantua's River Mincio flows into the Po. Veering north, you cruise through the lush wetlands that finally emerge into the glorious "lakes" of Mantua. A day dedicated to the discovery of this little visited cultural gem, its three picturesque "lakes" formed by the Mincio, and its surrounding countryside – once a City State ruled by the Gonzaga family and now considered by many as Italy’s "Sleeping Beauty". 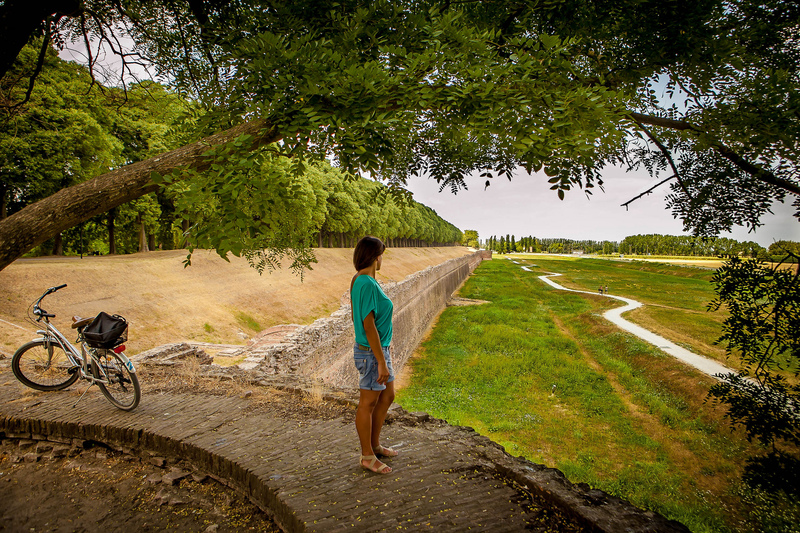 This afternoon we meet our Mantuan guide for a walking tour of the historic center, and enjoy the rest of the day in town, at our own leisure. Our bike and barge from Venice was fantastic. 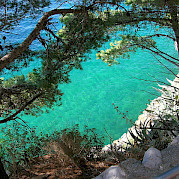 The villages were quaint and the opportunity to swim in the Adriatic Sea was a great way to cool down and relax. Our trip aboard the Ave Maria was wonderful. Captain Connie, Enrico, Giuliano, Silvia and Helmut made our trip to be quite memorable! Giuliano and Silvia made fabulous gourmet dinners for us. Our only complaint would be that there were periods of riding on dikes/floodbanks but all the stops along the way were very interesting and full of character. The visit to a Grana Padano cheese plant was followed by a wine and cheese picnic and our ending destination, Mantua was beautifully surrounded by 3 lakes. We would definitely recommend this trip! 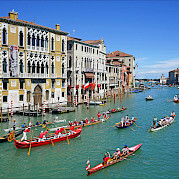 The most memorable part of our Mantova to Venice trip was visiting chioggia, the carnival museum and the cheese factory. Best part? Riding through small towns that most tourists don’t see...like Bergantino. The small group on the barge. I remember the day on a slightly "tricky" route into Chioggia. When we could bike into the town and rest our bikes for the first look-around -- what an enchanting place in such good company. We knew there would be another gourmet dinner that evening on the barge. Looking forward to another trip through Tripsite. Ave Maria barge was so very comfortable with wonderful staff & fabulous fresh locally sourced food, beautifully presented. My husband and I love Tripsite. We are about to embark in 2019 on our third such bike and barge holiday. We did Brussels to Bruges in 2017, Mantova to Venice this year (2018) and have already booked for 2019 to do a 6 country river boat and bike trip down the Danube. We find the combination of being on the water in a comfortable barge enjoying great food and company, coupled with daily activity a wonderful combination and experience. Biking through the various countries during the day after a hearty breakfast, packed to enjoy a wonderful packed lunch along the way is an altogether thrilling and fulfilling experience. We highly recommend Tripsite and the wonderful holidays they offer. All the work is coordinated. All you do is get out and enjoy your vacation. Well done Tripsite! A job well done. Our guides were amazing made sure no one was left behind. I wish there would have been transportation for us from the train station to the boat. Other than that the trip was amazing and I would highly recommend this. This trip was the perfect balance for experiencing Italy as well as being physically active. The most memorable part of the trip was being with a group of like-minded active and curious people! The knowledge about the country that our guide, Hein, provided at sporadic times. He was very astute to stop on a hillock for a small respite when there was no “cafe” in sight. Great information. Mantova to Venice was wonderful. Very pretty scenery with lots of unique places to stop. The food on the barge was terrific--as was our guide Fabio. Come prepared for 5 serious days of biking as well as bringing the right/complete biking clothes. A thoroughly satisfying experience in all departments! The staff were welcoming and friendly, instructive and knowledgeable. I felt entirely safe in their hands. Accommodation has been well designed and thought out. I shared a cabin with a friend and it was easy to find our own space within a relatively confined space. The food was DELICIOUS! The meals exceeded expectations and were presented beautifully; the chefs having entertained us with their 'Two Ronnies' routine at the outset of each repast. I have made a batch of refreshing lemon and ginger cordial since my return, which is perfect for a hot summer day and reminds me of a very happy holiday. The bike was a delight to ride. I'm not a regular cyclist and I found the daily trips enjoyable and, with the regular stops, entirely within my capabilities. The one day off I had, sailing along the canal, added an extra dimension as it was so restful and enjoyable to watch the wildlife and the Read more… scenery glide by. 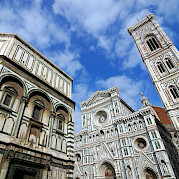 The guided trips were enlightening and I now have a 'feel' for the part of Italy we traversed. From the start we felt like guests at a houseboat party. It was interesting to meet and enjoy meals with others from various countries and backgrounds. I shall be talking about this holiday for a long time thanks to you all. Best part: Riding through amazing scenery and picturesque villages in Northern Italy! Hein was a most engaging and entertaining guide/trip leader. The rides were well planned with interesting stops and sightseeing, beautiful scenery and it didn’t hurt that we had spectacular weather. Post ride relaxation and camaraderie on the deck was great as was the value priced bar for beer/wine! The evening dinners were wonderfully prepared meals, truly excellent and overall the trip was very affordable, an A plus value. Montova was a really lovely spot and I liked the cycling around there. It might be easier in the towns if the cyclists all had either jerseys or pennies to identify the group so locals see we are all together which would prevent us from getting cut off or unable to pass. Had an absolute great time on this Tour. Venice was amazing and Mantova as well. Our cook was Erica who is wonderful chef. Every meal was impressive— creative and delicious. This was my fifth bike/barge tour and she is definitely the best cook. Really enjoyed my fellow Travelers, as well. You mentioned that you had been on 5 boat/barge trips. Which was your overall favorite? That’s a hard question. They all were special in different ways. But if I had to pick a fav it would be the Paris-Bruges trip. Every aspect of the trip was as expected or better. Most memorable part? All of it! Fantastic! Most memorable: Hein! And Marco! The whole staff! Loved every minute. Loved the e-bike too. I was so impressed with the level of service and detail on this trip. Completely exceeded all expectations from the guides and the rides to the food and the lodging. So much fun! It didn’t hurt that we had perfect weather. Hoping to do it again! The best parts of the trip were the staff, the food and the camaraderie. The bike rides, the scenery and the towns visited could not have been better. It was an all around outstanding vacation!!! Every day was a new adventure, loved it all! Most Memorable Part: Biking with Hans as a guide and the side trips we made. Most Memorable Part: Being part of a bike family for a week with wonderful people from several countries! And our tour guide, Helmut ... Capt. Giovanni ... Crew/Chefs Sylvia and Samule, who made the week even more special! Riding through the small towns was fun!! Ready to go again!!! Most Memorable Part: Venice in the rain at midnight! Excellent food, great staff and guides. My most memorable part of these trips are always at the halfway mark when I realize they are almost over and I want them to go on and on forever. 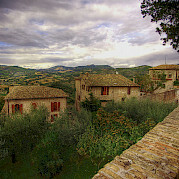 Italy is so beautiful and the ride to Montava is an extension of that beauty. My suggestion is simple: Do it. Don't wait. Go on a big cruise ship when you are too old to walk, but as for now, if you're able to bike, you're able to bike tour. Touring is different than racing. Its relaxing and invigorating, spiritual and memorizing. Seeing Italy at ground level and at 11 mph is the only way to experience it, in my book. Our guide, Hein, was the absolute best. Knew everything about history, culture, architecture, food... Had a great sense of humor. Best guide in 10 bike/barge trips. The trip was amazing: excellent food prepared by our 2 chefs; our guide was well-prepared, thoughtful, good-natured; the route was beautifully planned and educational, the bikes were more comfortable than my own, the weather was fortunately perfect, and we had a great group to bike with. The experience went way beyond my expectations . Can’t wait to plan the next biking adventure. 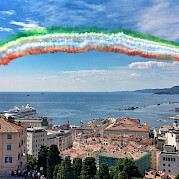 Most Memorable Part: The beautiful scenery of Italy and the connections we made with the other guests!!! Everything was excellent! There were a limited number of available rental helmets, I highly recommend bringing one's own from home. What a wonderful week!! Excellent staff...Captain, Helmut, Silvia & Samuele! Food was 5-Star, very comfortable accommodations! Helmut was a great guide, knowledgeable and made sure we all had a good, safe time! Bike riding was so much fun and we saw many different towns and sights we would have missed in a bus! Meeting so many wonderful, fellow bikers from different countries was so enjoyable! This trip was more than I ever expected!! Loved it!! Definitely will travel with Tripsite again!!! Bike On!!!! Everyday was fabulous. So difficult to pick any one memorable part when you experience Venice, Grana Padana tour and tasting, the oldest clock in the world, a lotus flower lake and charming friendly people and staff. This was my third bike and barge with Tripsite, but it was not my favorite. The boat, crew and food were terrific. The route however was flat as advertised, but the night stops were not fun or interesting. Zelo had only a cemetery and an Irish pub. If I was asked by a friend which bike and barge to take for possibly a once in a lifetime trip, I would recommend Bruges to Amsterdam and the Mosul River trip first. We had a wonderful time and everyone on the boat and the guests were first rate. I would take another trip on The Ave Maria, but would want a more interesting route. Friendly knowledgeable staff, delicious food, great bikes! It truly was the vacation of a lifetime, and we can't wait for the next one! Everything was memorable. I took this trip with my sister not having any expectations. Besides the great accommodations, food & scenery, there were strangers from 8 different countries that became a bike family for 8 days. It was a wonderful trip. This was a fabulous trip. Truly amazing. The food was the best surprise of the week!! It was delicious!!! Our tour guide Tamara was excellent, she made every day very very interesting. She went above and beyond. Can't wait to do another trip with Tamara!! 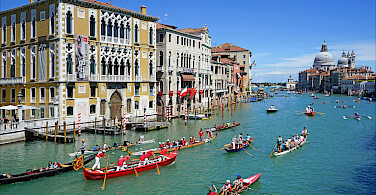 Most memorable: The scenery in Venice, Lodi and Chiogga. Excellent dinners after cycling along some wonderful and varied routes. The tour guides were excellent and kept a great pace for all cyclists. Different activities and surprises along the routes almost every day. Highly recommend this trip. If you plan to travel in July, be prepared for hot weather. My most memorable part was the daily bike riding thru the beautiful scenery. My only suggestions would be to spend a little list time at the beaches. The scenery, the biking experience, excellent travel guide, Helmut, the outstanding crew, other bikers and the canals were very memorable. Our only suggestion would be to shorten the time at the beaches. Great trip. Irene was a great guide. She adopted my suggestion that she wait for the stragglers to catch up to the stopped leaders so the stragglers could have a short rest also. Her suggested side tours were great. Our chefs, Samuel and Enrico were great as well. 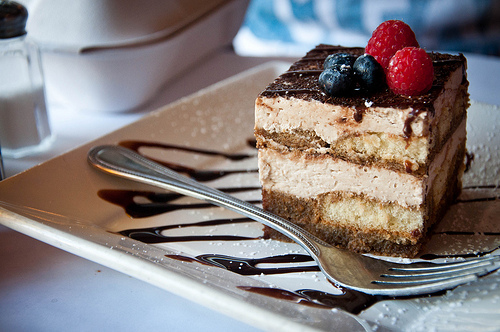 Superb food. First class trip. The most memorable part was stopping for lunch in a vineyard! The most memorable part was the chef and guides!! I returned May 9, 2017 from Italy from the best trip of my life. It started out from a conversation with a retired flight attendant a year ago and became a reality on April 29, 2017 when I had the great pleasure of boarding The Ave Maria from Mantua Italy to Venice Italy. From start to finish it was perfection. The boat was quite accommodating with our 3 bunk cabin, lovely dining room and sun deck to visit with our group of sixteen from Michigan, Nevada, Florida and Texas. The crew of 4 were fantastic and the food was superb. Everyday something different and delicious. The bike riding and touring through the countryside was phenomenal all because our guides Hein and Alain were exceptional. At age 64 I have enjoyed a lot of different destinations, but this trip by far exceeded every expectation I had and I would attribute it all to the fabulous crew and guides. Thank you so very much! The most memorable part was the guides and crew of the ship - the customer service was OUTSTANDING!!!!! I would absolutely recommend this trip. We felt we were very lucky to have Hein as our guide. His insight was wonderful. Memorable: the towns of Mantova and Ferrara were lovely and I enjoyed having time to spend in them , instead of merely riding through. The food was glorious and I felt the staff went the extra mile for us with a few perks and personal attention if needed. Clearly they like their jobs and it showed. The entire staff was impeccable. They aimed to please and all had wonderful personalities. My only regret was wifi being shut down at 11pm. This was the best time for me to talk to loved ones. Other than that, it was great. Feedback from my group was positive. Everything was memorable from the wonderful cabin to the great gourmet food to the wonderful leader Hein and fabulous staff. The route is scenic and we made stops at interesting places like the Rides Museum, Grano Padana, and the non-bird sanctuary! Loved it and have highly recommended it to friends. The staff on the Ave Maria was fantastic. They made sure we got everything we needed. I liked the way even the captain of the boat helped serve and clean up. They really worked as a team and worked very hard! The food was awesome and I really enjoyed the stops we made and the tours we had. Bike guides (Michaela & Ronnie) and boat staff ( Erica, Juliano, Enrico and Luciano) were all exceptional. Their care, expertise and concern throughout the trip was what made it exceptional. The Tour Leader Hein was amazing and showed us a wonderful experience. The cycling was spectacular and the food so exciting and very innovative. The bikes were heavier than I am used to but they were appropriate for the terrain. Everyone was helpful -- fabulous staff. I've already recommended it to my friends. I would do it again, but only if Hein were the Leader. Everything was great. I really enjoyed our guides, Tammy and Ronnie. The staff on the boat were great. Our bikes were top notch. The tour and countryside were scenic. I loved biking on the sea wall. I thought the other bikers were friendly and easy to get along with. The most awesome trip and staff! The barge was clean and well equipped. The staff was stellar, the meals great, the guided bike rides the best. No room for improvement and I hope to do another Bike and Barge on the Merlin. I especially enjoyed the bike routes, touring small villages along the way, and the guide Lia who was well informed about the area and Germany in general. The boat, staff and food were all exceptional. A quality operation for sure. Having the owner Pierpaulo stop in for a visit and having dinner together was a nice touch. We booked this trip for a group of riders with a wide range of abilities and it worked very well for all. It was all enjoyable. Food was amazing. Staff were very accommodating. Rooms were spacious and clean. Only negative was it said it was a 7-day bike trip and only rode bikes 5 of the 7 days. Falsely advertised. Glad you had a great time! The tour is 8-days in length and in the Day-to-day itinerary you will notice five days of biking. We try to make this very clear discussing the riding as well as listing the daily mileage. The whole experience was very memorable. The changing scenery, the background info provided etc. was great. The quality of the barge added to the overall enjoyment. One of the highlights was watching how well the crew worked together and genuinely seemed to be having fun. It was a very unique experience that surpassed my expectations. I wouldn't hesitate to recommend this trip to anyone. This is my first bike and barge experience and will definitely not be my last. Although others in reviews said the Vita Pugna was "tired". I saw it as wonderfull vintage barge, with a crew that loved it and showed their care for it in their care for us. The food was outstanding and any hopes I had of losing weight on the trip were quickly dashed with each evenings meal. We joined a large group of Kiwis onboard, with 2 Brits and thoroughly enjoyed ourselves. One thing that would have made the trip even better would be a different pillow; the one I had was too high and too hard for my taste and left me with a stiff neck in the morning. I loved the small villages. The international mixture of the group made for excellent discussion among the group. Food on the barge was excellent! This was a fabulous trip all around! The group was friendly, and guides were helpful and knowledgeable! Dinners were delicious and varied, stronger than expected for this type of trip. 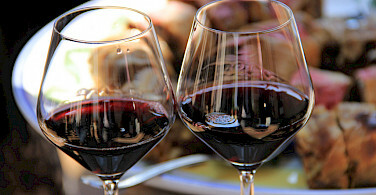 We really enjoyed being able to purchase wine on board the ship, also. The riding was varied, and we really appreciated that our guides made sure to schedule a mid-morning break for coffee/water/toilet. 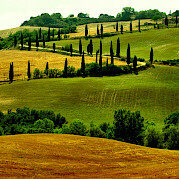 What a great way to get a sense of this part of Italy - from small villages and farm fields to Venice - just spectacular! One suggestion for improvement: for riding in really hot weather, it would be great if there could be a little more flexibility. We rode during a heat spell (40 degrees Centigrade one day). It was difficult to shift schedules or shorten our rides due to logistics, and this created some health issues. Thank you so much for your feedback. Due to the route of the boat, it is difficult to shorten the biking portion and still meet back up with the boat. However, you are always welcome to stay aboard the boat if you you find the weather unsatisfactory. Glad you had a great trip despite the hot weather! A fabulous experience. We will seriously consider further barge/bike holidays with you. It was a wonderful trip! I liked that we got to be on the barge when it moved (one time at the end of the day and another in the morning). The food was outstanding and I liked that the chefs described dinner and suggested wine pairings. The barge was very comfortable - even with 3 in a cabin. Our son (22 years old) was outnumbered by the over 50 crowd but Hein made him feel welcome. Only suggestion - mirrors on the bikes (although I realize that makes them difficult to store and move) and a brief intro on riding in groups. This trip gets a +10!! The staff (Tamy, Ilena, Luciano, Enrico, Guilio & Alberto) were amazing - fun, personable, knowledgable, friendly and engaging. They were truly a team and clearly enjoyed each other which ripples out to the experience of the guests. I loved that they gave a 'brief' the night before to let us know what to expect the next day. The food was creative, fresh and lovingly prepared. The accommodations on the AveMarie were great -- the cabins were well thought out with lots of storage so that the room felt spacious. The dining room was lovely with plenty of space to relax. The price of wine/beer was very reasonable and loved that we could keep a tab and pay it at the end, so easy. Oh yea the bikes --- a good ride and comfy enough for the distances ridden. The routes were well planned, even the few times we had to ride in traffic. The trip leaders were excellent at managing the group and making it fun, no matter what we were Read more… doing. I am already dreaming of my next trip. P.S. The bad and the ugly -- honestly I don't have anything to contribute for improvement. The crew were AMAZing! Every single one of them. Tami is an amazing guide - super friendly and helpful. All of the crew helpful and a delight. I would definitely go on this type of trip again because of my experience on this trip. This was my first bike & barge. The bar has been set very high! The biking was not as scenic as other trips I have been on. However the food, staff and guide were excellent. Our Guide, Rosita was excellent, friendly, pleasant and very knowledgeable. Would recommend her anytime. Recommended for novice cyclists only. Not challenging enough for experienced cyclists. Sometimes it would have been nice to stop for pictures of the scenery, but did not want to go to the back of the pack or be left behind. Helmut was an excellent guide and made sure everybody was safe. Food on board was the best I had in Italy. Staff very friendly and went the extra mile for our friends birthday. We should have trained more for endurance. The guides were wonderful and took such good care of us. The bicycles were amazingly comfortable. Beautiful dinners nightly. Thank you all. This was our second Tripsite trip, last year Germany, this year Italy. I have highly recommended your trip to all my friends. We hope to have the opportunity to take another bike and barge. We've experienced three Bike and Boat Tour in the past 15 months, and have already booked another for 2016. We absolutely love this mode of travel and the fact that it offers an active holiday, and the best of both site-seeing and exploring the countryside in a way that most other tours simply can not. We love sharing our experience with like-minded international travelers, and find we are extremely well treated by boat staff and guides.Together with the Tripsite staff, the website is a fabulous tool for selecting a holiday in that it allows us to compare boats, distances and routes. As a secondary benefit we find the Bike and Boat Tours offered by Tripsite to be excellent "value for money". We have recommended Tripsite to several friends and acquaintances, some of whom will be joining us on our next tour as "first-timers". The trip was great but the route was less than expected. The route was too much bike trails away from villages. We will definitely recommend Tripsite but not this trip. We look forward to our next trip with you guys. Great guides made the trip for us. Allowing 2 bike groups with different strengths was the best way. We have done 8 trips with Tripsite. All trips were great. Ave Maria, as well as 3 previous trips on the Merljin, superb. Some guides on Merjijn were mediocre, but Hein is incredible guide/person. Friends have recently taken B/B Red Hat?, bad experience. The above 4 trips speak highly of your program. Looking forward to next trip, F2017. We loved this trip! It was so fun for our family of four. Our two boys, ages 11 & 14, enjoyed biking and stopping off to swim in the ocean, trying new delicious food, and learning from our wonderful guide, Fabio. The boat was very nice and the crew were lovely. We had record setting beat the week we were there and yet still had a fantastic trip. The rooms stayed reasonably cool with the AC-- that was a life saver to have available. If I had to change anything, I'd probably like to have the boat docked closer to Venice proper so it would be more accessible on arrival and through the first couple days. We made it work-- all a good adventure. The scenery on the bike route was relaxing-- not terribly dramatic, but really nice for small town explorers, birders, and those who enjoy farmland/pastoral scenery. Pros: delicious food, easy cycling terrain, excellent City/town tours, comfortable rooms, great value, easy logistics when you don't have to Read more… move your stuff each day, meeting nice people from all over the world. We had a fantastic time on the Ave Maria and we're lucky to have Hein as our guide.....great guy! We have been on seven or eight bike and barge trips in the past and this one was, by far, the best. From the greeting upon arriving, to the spacious and comfortable accommodations and exquisite food. The guide was pleasant and very informative ( great sense of humor, too ) Our hotel reservations in Venice were cancelled at the last minute, but he was able to get us a room. The Ave Maria is a beautiful boat with everything you need. We can't say enough about every crew member. Part of the scenery was not as nice as on other trips, but that couldn't be helped. People at Tripsite were always very helpful and quick to respond. We had a wonderful time. We will highly recommend this Tripsite adventure! I love our leader Michaela and we want to do another trip with her. I have recommended the Pugna boat Mantova-Venice trip to many people. Our tour guide Marco was ok, but not outstanding. His commentary was adequate, but we got more from the notes provided. Tedious farm land, 30 mile an hour winds. Our guide and staff were fabulous! Put them on a little more picturesque route and I would say yes. Marco was absolutely wonderful! We were self-guided for 3 days. The road guides given us were written for bike riders using a GPS. No GPS was provided. Thus, the guides were a bit confusing. We didn't notice the odometers (and they were not pointed out to us during our orientation) on our bikes until it was too late. We should have attempted to track our mileage against the miles listed from point to point in the guide book. Instead, we followed the advice we were given during orientation, which was to just follow the green arrows. We got very lost one day. We followed the arrows in the wrong direction! We should have paid more attention to the road guide. It might be good to update the guides if GPS's are not going to be provided. Personally I would have preferred another day of biking and a day less in Venice - If people wanted to see Venice they could stay an extra day or so after. I'm filling this out as we booked with you twice--Burges to Amsterdam in 2012 and Venice to Mantova in 2014. both were bike and barge. We are about to book with you for the spring of this year--we are looking at 2 in Germany and the northern Netherlands We have yet to make up our minds on which one. We have had a great experience with your company and looking forward to another. Our trip to Venice on the Ave Maria was our best cycling trip ever. Meals were fantastic, bikes excellent, Helmut a great guide. Loved the barge conversion to accommodation. Have recommended the trip to many Canadian friends. Hope to do another tour with you next year. Depending on the potential participants: Even though we had read the pre-trip information several times, we were still surprised that the biking days were of pretty similar length ... we had thought there would be longer days mixed in with medium and shorter length days. Overall we were very happy with the trip and most impressed with the people who took care of us: guides and boat crew. The Ave Maria seems perfect for its job. We will be looking at other trips with you. Scenery would have been a bit better if we'd gone two weeks earlier. Mid October was a bit late. We enjoyed this trip very much. This was our first bike and barge trip and we would do it again. The entire staff was great and the guides were super. I did not hear one complaint about anything from any of the guests on board. That is testimony to a job well done in seeing to the comfort of the passengers and the enjoyability of the bike ride. Aside from all the other wonderful parts of the experience, I cannot say enough about our guides and vessel staff. My good experience began with the Tripsite contacts well before the trip was ever made. This was a fun, easy ride. Our 2 guides made the trip into a party, even when it was raining. This was the first time I had a really good bed to sleep in - just like at home. The rooms were a good size as were the showers. The crew was fun and we made pasta for our dinner one night. The food was fresh and excellent, and there was plenty of it. These are also the best bikes I have had on my trips. Super, easy and fun trip. Our group had the misfortune of 25mph+ headwinds for 4 consecutive days through barren landscape. My hesitation to recommend this trip is not however based on the weather but rather the lack of interesting terrain. I liken this biking to a trip thru Nebraska. Our stops in the villages were poorly timed, shops were closed and our short stop precluded investigating any historical attraction. The charming aspects of European villages, exploring the local cuisine were non existent. Every day we were advised to bring a sandwich. In complete contrast, the bike/barge trip in France visited medieval villages and provided enough time to enjoy a meal in a bistro. Understandably this trip along the Po might be selected by those not willing to bike the hills but biking for hours on an elevated levee and looking at clods of freshly tilled earth is hardly a huge endorsement for this option. Our first bike and barge experience made unforgettable by creative, delicious and healthy meals, an outstanding guide with a great sense of humour, extensive knowledge of the areas we cycled through, and much patience and warmth. We arrived as nervous neophytes and left feeling we were part of the family....and cycling athletes to boot! The whole experience was awesome! Mantova is a great little place to visit. Lots of history, architecture, fine people, good restaurants. The barge was comfortable, spacious, clean. Food excellent. Staff extremely courteous, helpful, upbeat. Bikes were adequate for the terrain, sturdy, in excellent condition. Some of the trails were uneven, even rocky, but I personally had no issues. Some of the less experienced riders felt a little uneasy on them. 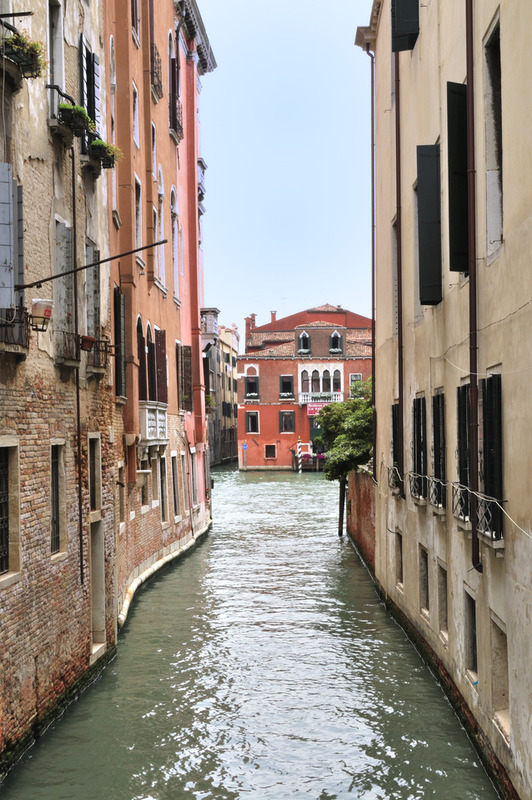 The city of Venice was a disappointment (crowded, polluted and dirty) but Venice is Venice... The whole bike 'barge adventure was, plain and simple, unforgettable. Highly recommended. Thanks to everyone for making it so special!!! Barge part of it was excellent, riding for 2 of the days got to be long and monotonous, scenery always the same, but staff did great job. I'm probably critical a bit because I did a Holland bike ride that was so scenic. Guide stopped to much for cappuccino, kept us bunched up, which was unsafe, had a sick person that should of been hospitalized. Want more milage not museums. This was our 10th trip, I believe, with Pack and Pedal and it was outstanding! The Ave Maria was a beautiful boat; modern, clean and roomy. The three of us from Kansas City: Stanley, KartaPurhk and myself enjoyed the company of 27 others and it was a week of great riding, camaraderie and superb food. The crew of the Ave Maria: Tullio and , Luciano got the boat to where it needed to be safely and on time every day. The chefs: Vera and Erica prepared wonderful meals each day while catering to individual's specific dietary needs. Helmut, our bike guide was patient and knowledgeable. It's not easy herding 25-29 bicyclers safely each day from point A to point B and back to the boat each late afternoon. a "well done" to Helmut. The real highlight of the trip for the three of us was getting to meet Hennie for the first time when she visited the Ave Maria. What a delightful person she is! The trip exceeded all of our high Read more… expectations and we look forward to our European trip next year through Tripsite. 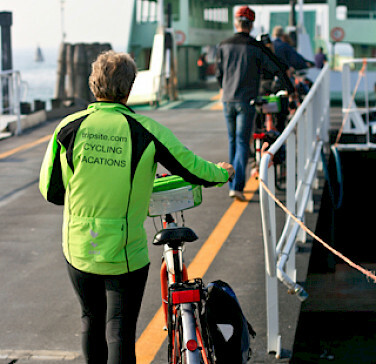 In May of last year we embarked on yet another Bike and Barge trip with the assistance of your organization. We were on the great barge Ava Maria, Montova to Venice. We have travelled extensively over the last 40 years but have never had such a great experience as this. The trip was well planned led by a terrific tour director who was not only knowledgeable but great fun. The staff of the barge were exceptional providing all on board with a superb experience, great food and friendly service. As has been my experience with Tripsite in the past, my expectations were exceeded and given that we are now planning another adventure in France with of course Tripsite. Thank you for MAKING our vacation! This was our first experience with an inclusive tour and we were a bit apprensive about the lack of freedom. No worries! It was a great trip and we would do it again. The small boat/group was key. Great food, excellent tour leader and first rate crew. We would not want to be in a larger group. Three cheers for the older and smaller boat! 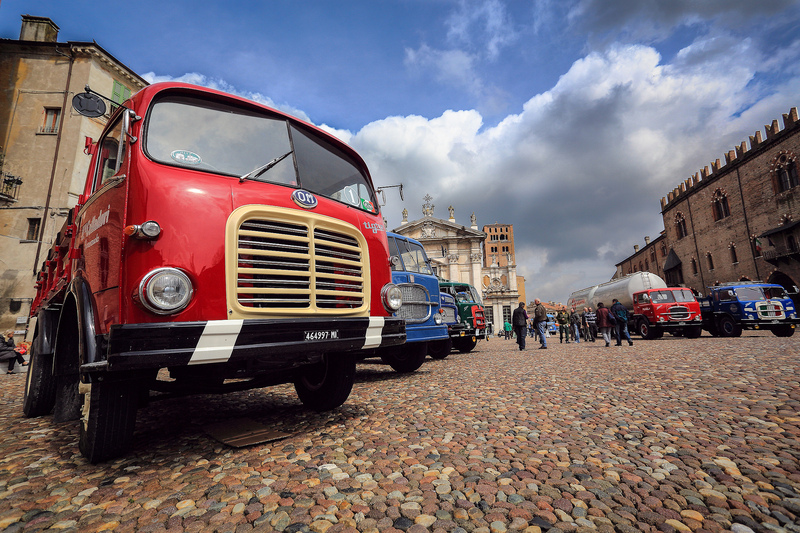 We took the Venice to Mantova tour in September, 2013. The AveMarie is a luxurious boat. We were very happy with our cabin and our accomodations. The crew was exceptional and went out of their way to meet any needs. Martina, our guide, was also exceptional. The food was excellent. The bikes were standard, sturdy hybrids, all in good repair. The roads and bike paths were 90% flat and easy but 10% harrowing because of traffic! Wear a helmet. The camaraderie made the trip special; I think the Girolibero crew gets credit for creating a sociable atmosphere that made the trip fun for everyone. 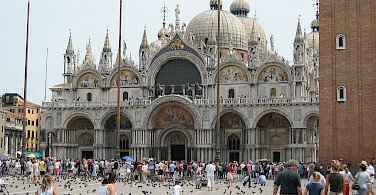 We took Mantova to Venice tour Aug. 10th. The guide (Amermario) was top notch. The food was heavenly. The five person crew did everything possible to make us comfortable-including one unscheduled stop to pick up a rain soaked 30 riders! Ave Marie was super-including wi-fi! Our trip, Venice to Mantova April 27th 2013, was absolutely spectacular. What can I say, the venue, facilities, amenities, equipment, guides, cooks, etc ...all exceeded expectations. Our chief guide and host, the friendly and indefatigable Hein Hoefnagels, was superb in making a last minute route and program change due to the unexpected Po river springtime flooding issue.. A very fun time, meeting some great people, learning about and seeing many historical sites.. this truly was an unforgettable experience.. My Bucket List , instead of being reduced by one, has probably been 'added to' for a repeat. !! 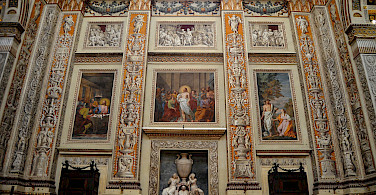 My husband and I went on the Venice to Montova trip September 2012 and had a wonderful trip. Our guide Fabio was fabulous and the food was so good, I was worried I'd put on a few pounds. But with all the biking, I think I lost a few. The barge was so comfortable and the crew did everything possible to make our stay comfortable. 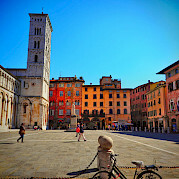 We loved the towns and the sights, especially Montova and Venice. Such fascinating country. The terrain was flat enough that the biking was very manageable. One day we did more than expected, about 45 miles and it was windy, but we made it with the great bikes. We are definitely planning on taking another bike and barge trip through Tripsite! We loved the trip from Mantova to Venice. The crew on the Ave Marie was great. We convinced two other couples to join us this year since we had such a good time in the Netherlands last year. By the second day they were already wanting to plan next years bike/barge trip. I thoroughly enjoyed my barge and bike trip from Mantova to Venice in July of 2012. I would not change anything about my experience. 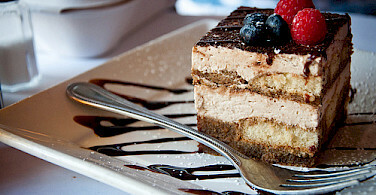 The barge was very comfortable, and Juliano's food was excellent! The roads and paths we cycled on often allowed us to ride and chat alongside one another, which I liked because I was travelling by myself. The cycling was easy, but there were a few instances where we faced strong headwinds. 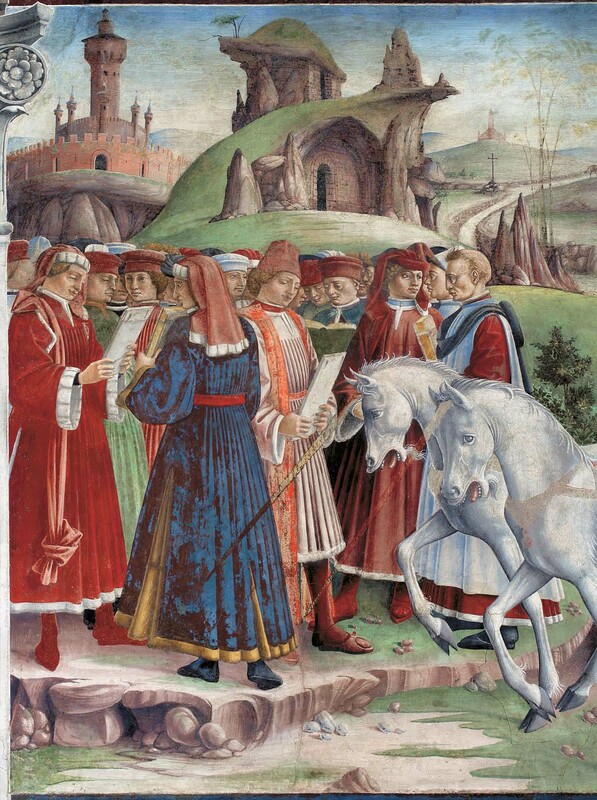 The villages we travelled through were small in the beginning, but got larger as we approached the coast and Venice. 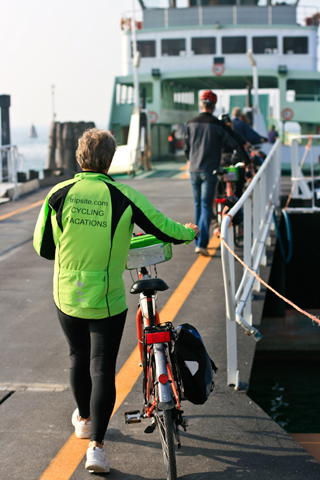 The entire group interacted as they wished on board the barge and while cycling. The guests and the staff were friendly and fun. I would not hesitate to recommend this trip. Our group of 10 Canadian friends took this tour July 9-16 and we were met with a better-than-expected trip! Super staff, outstanding food and great accommodations aboard the Ave Maria keeps us talking about this amazing time we had. We'd highly recommend this tour - it was flat and very doable by any age! Tripsite is the best and we are planning our next excursion for 2013. 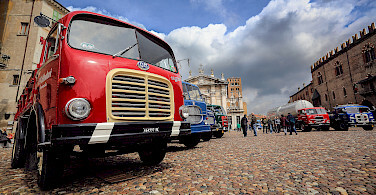 We were very impressed with the trip on the Ave Maria July 9 - 16, 2011 from Mantova to Venice. It far exceeded our expectations! We were amazed at the quality of the rooms and the fabulous food prepared by our chef Juliano! Our tour guides, Helmut and Martina, were incredibly knowledgeable and had many interesting facts to share with us each day as we went from town to town. The bikes were wonderful as well. With 32 riders, none of us had any issues with the mechanics of our bikes. No flat tires, no chain problems, no gear issues, etc. Even the panier bags were perfect for carrying our lunch, water bottles, cameras, swimming gear! Our group of friends were so delighted with this trip that we are planning our next one with your company to go to France in 2014! We found your staff to be very friendly and helpful. Thanks for making that leg of our trip so successful! We took the Mantova to Venice bike & boat trip in early July 2011. We started the tour from Bolzano and were delighted that we did. Bolzano is an interesting place to stay a couple days before biking. Do not hesitate to do the "uphill" section on the 1st day. The towns and hotels for this part were well worth the time and the trip across Lake Garda was lovely. Finding our way out of Pescheria was a little challenging; the villages on the way to Montova were noteworthy. Be sure to give yourself enough time to see Montova. The guided/boat/bike portion was great though hot weather plagued us in early July. I recommend this trip. The food on the boat was fantastic and the finale in Venice was a great way to end the trip. Ave Maria Italy Premium Class Boat The Ave Maria was launched in 2011. This Italian boat was totally rebuilt in order to meet even the highest expectations. The boat was completely redesigned by a renowned architectural firm. Its shapes, colors and materials were chosen carefully in order to create a warm, inviting and sophisticated atmosphere.